The Wall That Heals, featuring a half-scale replica of the Vietnam Veterans Memorial in Washington D.C., will be coming to Werner Park from August 3-6. The exhibit, which includes the replica wall and Mobile Education Center, will be presented by Werner Enterprises and open 24 hours a day over the four day span starting on August 3rd. "Hosting The Wall That Heals at Werner Park in conjunction with Werner Enterprises will be an incredible honor," said Storm Chasers President and General Manager Martie Cordaro. "We highly encourage everyone in the Omaha Metro to take the time to visit and pay tribute along with us to our servicemen and servicewomen in our Armed Forces." Approximately 250 feet long, the memorial wall bears the names of the more than 58,000 men and women who made the ultimate sacrifice in Vietnam, while honoring the three million-plus Americans who served in the U.S. Armed Forces during the Vietnam War. It will be escorted to Werner Park by local law enforcement on Wednesday, August 2 and on display beginning the following day Thursday, August 3. It will be open 24 hours a day until the evening of August 6, following the Storm Chasers' Military Appreciation Day contest at Werner Park, with closing ceremonies taking place post-game. "Taking The Wall That Heals on the road gives thousands more veterans and their family members an opportunity to see The Wall and honor those who have served and sacrificed so much," said Jim Knotts, president and CEO of the Vietnam Veterans Memorial Fund, the nonprofit that built The Wall. "It helps veterans from all of America's conflicts to find healing and a powerful connection through their common military experiences." Friends and family members of those who are honored on the wall are encouraged to bring a photo to the exhibit to be scanned and included in the VVMF's The Wall of Faces. 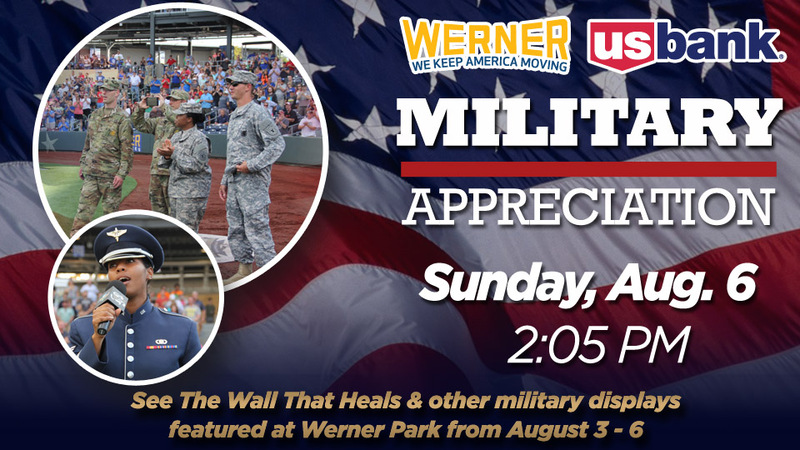 More details about The Wall That Heal's visit to Omaha, including opening ceremonies at Werner Park and the Storm Chasers' Military Appreciation Day on Sunday, August 6, will be announced later this month. The Wall That Heals has visited more than 500 communities throughout the nation since its dedication. These partners are proud to bring The Wall That Heals to Werner Park: Werner Enterprises, U.S. Bank, Omaha Storm Chasers, Centris Federal Credit Union, CHI Health, McDonald's, SilverRidge Assisted Living, AAA Nebraska, Budweiser of Omaha, Center Trophy, Pepsi, and US Foods. The Omaha Storm Chasers are the Triple-A Affiliate of the 2015 World Series Champion Kansas City Royals and play at Werner Park in Papillion, Sarpy County, Nebraska. For more information please visit omahastormchasers.com and also follow us on Twitter @omastormchasers and "Like" us at facebook.com/omahastormchasers.